More and more we are finding that magnetic tools are becoming extremely useful products. Let us say you are in charge of a machine shop or an airport runway where foreign objects can become a nuisance or even deadly in the case of a jet aircraft. Now what if there were magnetic sweepers that swept up these dangerous metal objects using magnets. Look no more we have those. A Magnetic Sweeper! If you are a welder that needs to hold your work to a welding table. Magnets are the ticket here too. What if there were magnetic tools that held your tools? A magnetic tool holder. Or move this into the kitchen with a knife magnet and a magnetic knife holder. 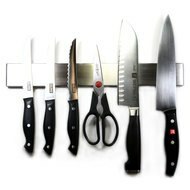 These magnetic tools clear cluttered drawers & cabinets and place the tools and knives at hand. Maybe a mechanic dropped a bolt into a part of an engine Magnetic CMS’ LED Pick-Up Tool with 32" Telescoping Body is the way to go! Perhaps back to the machine shop and you need to move 600 lbs of metal from one place to another. We have those too: lifting magnets! Or a neodymium ditch magnet. These are used in the oil fields to retrieve metal chunks & shavings form usually very muddy mucky areas to avoid damage to their equipment. Stainless Steel Magnetic Tool Tray 5-1/2" x 9"